Access to cellular networks is nowadays a requirement for many tasks. Everything from paying bills to checking online time tables to entertainment is relying on a mobile signal. While ubiquitous network connectivity is now a given for many, cellular signals have been degrading. Dropping calls and sluggish data transfer has become commonplace in new buildings, or old ones that have been renovated with energy efficient windows. This is because of the construction materials that are nowadays used contain signal blocking materials. Aluminium coated insulation elements and spectrally selective glazing do wonders for energy efficiency, but also block radio waves efficiently. Together with the use of higher frequencies to cope with increasing wireless data transfer the result is degraded cellular service. 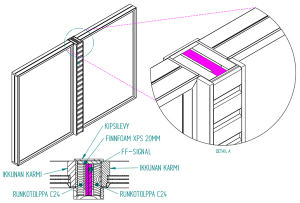 Finnish companies Finnfoam and Stealthcase have created an insulation material that lets radio signals pass through. This passive insulation board allows radiowaves through by using a passive signal repeater integrated. This allows of 30-100 fold improvements to signals within structurally congested buildings. The product consists of two Finnfoam FF-PIR (polyisocyanurate) boards (20mm), with an embedded signal repeating antenna element. The product is developed and manufactured in Salo Finland, a country with high building standards. Finnfoam FF-SIGNAL insulation boards are available to the market from February 2018 onwards. The insulation board receives the incoming signal from the cell tower and relays it forward through the structure. It works like separate passive repeaters, and does not amplify the signal. The product is tested in the laboratory as well as in field trials. The patented product does not require electricity or maintenance, is stainless, CE-certified and cost effective. It works with common cellular signal spectrums in 2G/3G/4G LTE networks, as well as upcoming fifth generation (5G) networks that operate on the 3,5 GHz frequency. FF-Signal boards do not limit the selection of window elements. It comes in elements of 200 x 1200mm and 300 x 1200mm. Boards can be stored outside in UV light while construction, but long term storage is recommended inside. The FF-Signal signal amplifier / antenna elements should be protected from the weather. Appropriately installed insulation elements will last for decades, making for a low total cost of ownership.